The architecture is called Core, processor family is Core 2, the product names are Core 2 Duo and Core 2 Extreme. In the past we've talked about its architecture and even previewed its performance, but today is the real deal. We've all been waiting for this day, the day Intel lifts the last remaining curtain on the chip that is designed to re-take the performance crown from AMD, to return Intel to its days of glory. What you see above appears to be no different than a Pentium D. Honestly, unless you flip it over there's no indication of what lies beneath that dull aluminum heat spreader. But make no mistake, what you see before you is not the power hungry, poor performing, non-competitive garbage (sorry guys, it's the truth) that Intel has been shoving down our throats for the greater part of the past 5 years. No, you're instead looking at the most impressive piece of silicon the world has ever seen - and the fastest desktop processor we've ever tested. What you're looking at is Conroe and today is its birthday. 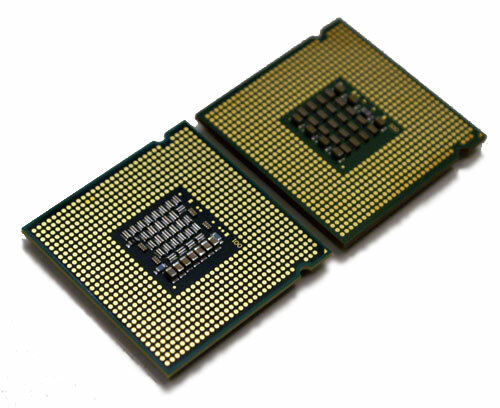 As the name implies, all Core 2 Duo CPUs are dual core as is the Core 2 Extreme. Hyper Threading is not supported on any Core 2 CPU currently on Intel's roadmaps, although a similar feature may eventually make its debut in later CPUs. All of the CPUs launching today also support Intel's Virtualization Technology (VT), run on a 1066MHz FSB and are built using 65nm transistors. 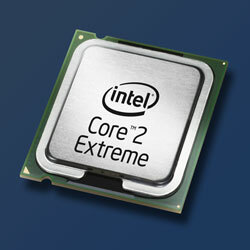 The table above features all of the Core 2 processors Intel will be releasing this year. In early next year Intel will also introduce the E4200, which will be a 1.60GHz part with only a 800MHz FSB, a 2MB cache and no VT support. The E4200 will remain a dual core part, as single core Core 2 processors won't debut until late next year. On the opposite end of the spectrum Intel will also introduce Kentsfield in Q1 next year, which will be a Core 2 Extreme branded quad core CPU from Intel. Core 2 Extreme is not truly "unlocked". Officially (per the BIOS Writers Guide), it is "a frequency limited processor with additional support for ratio overrides higher than the maximum Intel-tested bus-to-core ratio." Currently, that max tested ratio is 11:1 (aka 2.93G @ 1066 FSB). The min ratio is 6:1. However, do note that the Core 2 Extreme will boot at 2.93G unlike prior generation XE processors which booted to the lowest possible ratio and had to be "cranked up" to the performance ratio. In other words, you can adjust the clock multiplier higher or lower than 11.0x, which hasn't been possible on a retail Intel chip for several years. By shipping the Core 2 Extreme unlocked, Intel has taken yet another page from AMD's Guide to Processor Success. Unfortunately for AMD, this wasn't the only page Intel took. The new Core 2 processors, regardless of L2 cache size, are made up of 291 million transistors on a 143 mm^2 die. This makes the new chips smaller and cheaper to make than Intel's Pentium D 900 series. 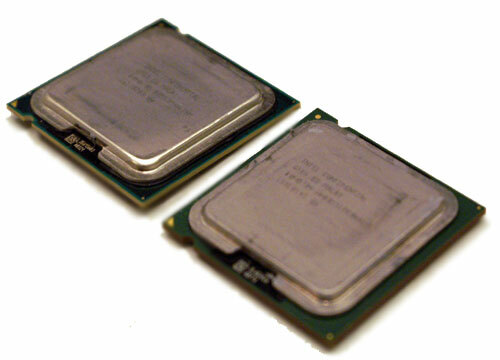 The new Core 2 processors are also much smaller than the Athlon 64 X2s despite packing more transistors thanks to being built on a 65nm process vs. 90nm for the X2s. Intel's smaller die and greater number of manufacturing facilities results in greater flexibility with pricing than AMD. This review (and the many others from other review sites) is interesting in that it confirms Intel's bold claims made back in March. Conroe starts shipping July 27th - the original launch date. Intel moved the launch date back two weeks because OEMs like Dell and HP were hot to start advertising and shipping Conroe systems. I suspect Intel was also trying to salvage their NDA. Good news is hard to contain and two more weeks of NDA would have likely resulted in more info leaks that Intel did not want to turn into a flood. You will be able to find answers at AnandTech to your basic Conroe motherboard and memory questions early next week. First off, when u guys reviewed a 486/33 for the first time... it was also "the fastest piece of silicon the world has ever seen"... then later, when u saw the P2-550... THAT was the "fastest piece of silicon... blah blah". Well its nice that intel has made a really expensive and barely available new chip, so they can finally match (or even exceed by a few points) AMD's reasonably priced previous generation. So now u can say they have the fastest, and if u want to spend thousands on a CPU that is only slightly faster than something that costs hundreds of dollars, HEY BE MY GUEST! there have been worse wastes of money! (in theory anyways, since the avg american wont be able to actually find any of these in the local stores for quite some time, if intel follows their previous habits). Anyhow the point of my comment... i think this is a good thing. i mean, anything that actually causes an intel fanboi to admit finally that intel has been reaming your butts for 5 years..
while the people who simply buy whatever CPU makes the most sense have been enjoying getting great quality nookie from AMD! SO i present to you, this Technical Quote of the Year, spoken on behalf of all intel fanbois with half a brain! "...power hungry, poor performing, non-competitive garbage (sorry guys, it's the truth) that Intel has been shoving down our throats for the greater part of the past 5 years." 80% of Intel crap, only 20% is good. The Pentium M.
So they say 5 years ago until now Intel was “all” crap. I think Northwood was/is very good.